With over 200 species, Mammillaria plants form the largest genus in the cactus family and they are mostly native to Mexico and surrounding countries. They are easy to grow, and flowering from an early age, the flowers form a ring around the top of the plant and come in a range of colours. They are mainly rounded in shape, most will form a tall column over time. The larger growing species can reach nearly 1m in height, and form good sized colonies. They are popular because they are attractive in form, mostly with good flowers and relatively easy to grow. 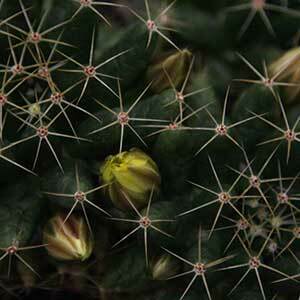 Diverse in habit and flowering colour, this is perhaps the most widely grown group of cactus plants. They vary in shape from taller spikes to rounded forms, some with ‘Woolley’ coatings. They are attractive in their own right however they also flower in summer to spring and the flowers are very unusual and attractive. 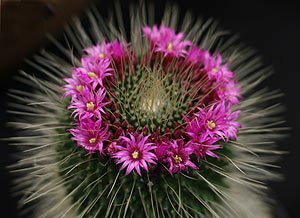 Mammillaria plants grow well in containers, and require a well drained potting mix to grow well. They are best grown in good filtered light rather than strong direct sun. Widely grown in a position where the fascinating flowers can be shown off to effect, they can also be grown in a rock garden, as long as drainage is excellent and they get plenty of sun. Use a free draining specialist cactus and succulent potting mix. It is best to repot specimens every 3 – 4 years. Water when in active growth and keep on the dry side in winter. Controlling winter moisture is the main problem with growing outdoors. In winter, plants grown indoors can be gently mist sprayed once every week or two to maintain a little humidity. Only fertilize during active growth, use a specialist cactus and succulent fertiliser at 1/3 strength. 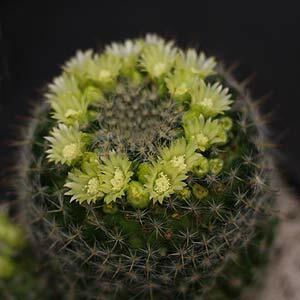 Propagation from seed is possible, Mammillaria are easiest to propagate by removing offsets. Offsets can be removed with a sharp knife and should be left to callus over before potting. Over watering and poor drainage are the main issues with growing these fascinating plants. M. elongata – With tall narrow growth habit this species has few common names, Lady finger Cactus, Gold Lace Cactus and others. Slender golden spikes to around 15 – 20cm. M. magnimamma – One of the toughest of all of the Mammillarias, this one grows on the lava fields, low growing and clump forming. M. hahniana – Also commonly known as the ‘Old Lady Cactus, rounded in form with a Wooly appearance, attractive pink flowers in a circle near the top. M. multiceps – Very low growing and rare in cultivation. M. johnstonii – Low growing with prominent spikes,a little unusual for the genus. Succulent nursery for drought hardy plants. Includes: Adenium, Agave, Alluadia, Aloe, Anecampseros, Crassula, Euphorbia, Gasteraloe, Haworthia, Kalanchoe, Ledebouria, Portulacaria, Sedum, Senecio and many others. (Succulents and Friends) Home to a variety of Succulents and Cacti plants including: Aloe, Crassula, Echeveria, Gasteria, Haworthia, Kalanchoe, Pachyveria, Sansevieria, Sedum and many more.